« Lomography Giveaway Winner Announced! 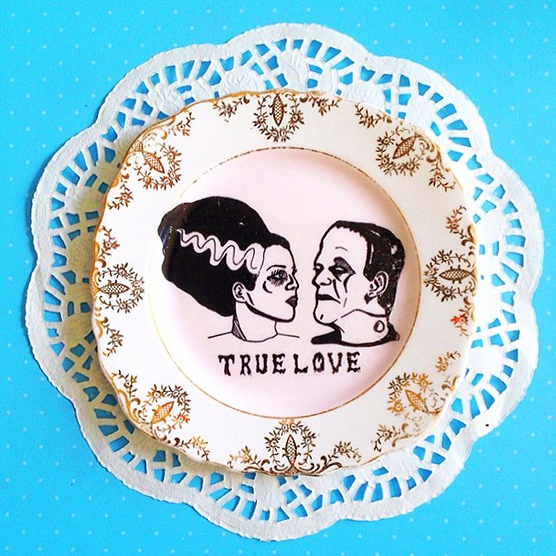 I love how you’ve successfully matched cult b-movie horror with country kitchen twee with your plate designs. Tell us more! As a child I used to watch all the gorey classics (Night of the Living Dead, Nightmare on Elmstreet etc) with my older brother, and then go off and immerse myself in my world of Barbies, Sindys and Sylvanian Families. The juxtaposition of styles is something I’ve continued to express into adulthood. 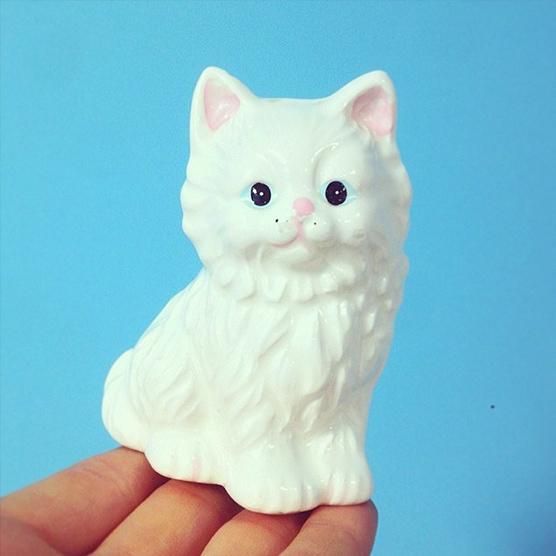 During my Photography degree my signature style was serious themes disguised in kitsch. Today I am a medical photographer, documenting the ailments and injuries of the general public and in my spare time, I rescue crockery. Apparently, the two go hand in hand! You’ve been renovating your home and above we can peek into your stunning living room which is nearly complete. Wow, what an amazing project! What has inspired your interior design? What have been the highs and lows? We got the keys to our house in July ’13 and it was an empty shell. It was a stark reminder of the work we had to come but made it easier to see its potential! It’s a victorian house and we wanted to reinstate and maintain as many of the original features as possible, which influenced a lot of the renovations so far. With the living room, the choice of wallpaper influenced the rest of the room. 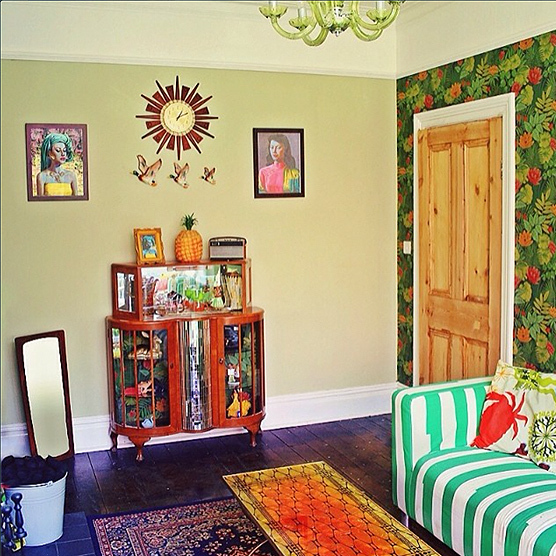 I didn’t want to splash out on Repro 70s wallpaper and not use it as an excuse to turn the room into a time warp! It’s been a huge struggle, but we’re getting there. The lows were one after the other for the first few months, when you’re coming straight from an 11 hour work day to a 3 hour renovating stint and straight to bed on your friends floor (living with my best pal was lovely, living out of a suitcase for 5 months was not!) every minor setback seems a huge blow. It’s hard to keep a level head when you’re exhausted and hysterical! Highs include the first time we got our sash windows open that had been painted shut for 20 years, finding a perfect victorian fireplace behind a boarded up wall and getting the boiler switched on after living without hot water or heating for 3 months! At times I got sick of hearing people say ‘it’ll be worth it in the end’ but they’re totally right, every small success makes it all worthwhile!! Cutest kitty cat you ever did see. You love to thrift and I love to see your finds. Where do you go to hunt and what tips do you have to score the ultimate finds? Collecting tat and scouring for treasure is ingrained in me from being dragged around markets and carboots as a youngster by my nan. The thrill and excitement of getting my hands on something that’s long gone is what gets me out of bed at the crack of dawn on a Sunday morning and takes up half of my Saturdays rushing around numerous town centres with my charity shop radar on. Its even gone a step further now, as my tat wife Laura (justlaura_ on IG!) and I have started a blog called Tat & That to celebrate our finds and share our treasure hunting escapades! If you want the ultimate treasure, you need to be dedicated! Car boots are a good call, and if you get up early enough (usually 7am for me) you can hit up 2 in one morning! Find out the names of makers (Hornsea, Johnson Brothers etc) and remember key words for eBay searches. Don’t be afraid of international eBay sellers, I’ve got many a bargain from America including shipping costs at a fraction of the price of UK sellers! Table top sales are good also – I find they’re usually frequented by old lady sellers with prime treasure who don’t like the cold of car boot sales! Keep your eye on the prize, you’ll get it eventually! 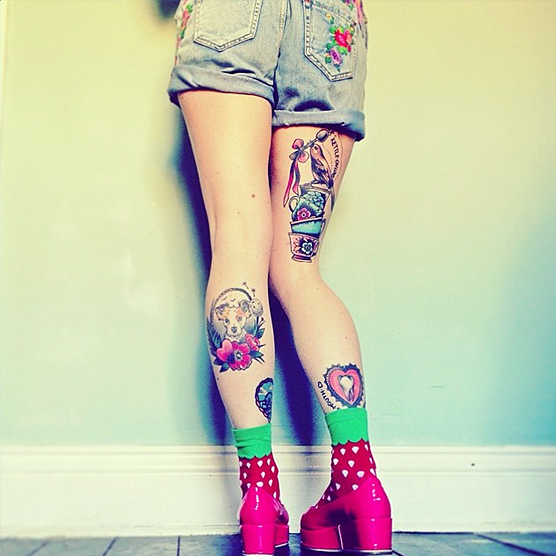 Cute ‘n creepy tatts to die for. My wardrobe (or more clothing rail – we haven’t put the wardrobes up yet!) is a mish mash of sorts. I’m a sucker for patterns and textures and I hate to be coordinated. I don’t like to be restricted by a certain style, I just wear what I feel like and it seems to come together on it’s own! I got my first tattoo 2 years ago (the teacups down the back of my right thigh) as a homage to my obsession with crockery, and incorporated a phrase used a lot at home ‘Stick t’kettle on love!’ So my parents saw the sentimentality and didnt tell me off! (They did though, despite being in my late twenties!) since then I’ve amassed a few more, and they all mean something or represent the people I love, that way they’re not faddy and I won’t tire of them! I have the family pet, Phoebe on my left calf, a tooth to mark the death of my wisdom teeth, Santa Monica boulevard and a pink castle birthday cake to name but a few! They are colourful and happy, just how I like it! Rescued furniture, up cycled with a witty sense of style. 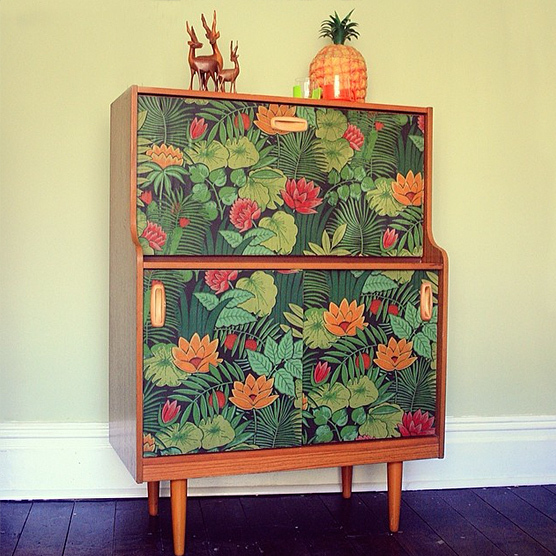 You rescue and renovate vintage furniture, can you explain the process to us and what DIY tips do you have for anyone trying this out for the first time. 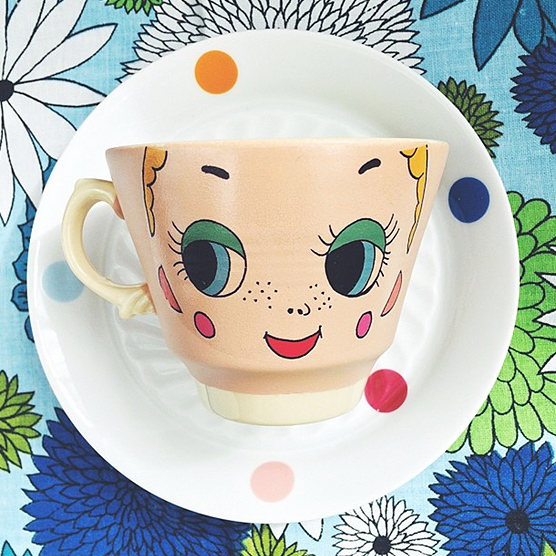 Twiggy face cups – one of the latest designs by Pilfered. Thanks Jenna! I absolutely love your photos, one last question, do you have any tips for taking ace IG shots? Follow Pilfered HERE and read her blog HERE. Hooray!